Available at a participating GolfBC property, your free GolfBC card rewards you in so many ways. Redeem points for free golf. 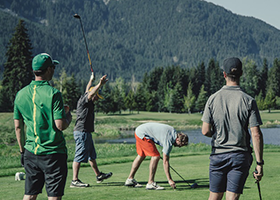 Get advance notice of special promotions and contests via the GolfBC electronic newsletter: eNews (email address is required to receive eNews and - sign up now). *Conditions: All points will be rounded up. For example: where a purchase of $2.89 is made, 3 rewards points will be earned. All points are awarded on pre-tax totals. Tournaments, groups, banquets and weddings are subject to a maximum limit of 5000 points. Reservations made through partners or 3rd party resellers (ie, golf packages) are not eligible for points. For additional restrictions, check the terms & conditions and the redemption schedule.